When betting on tennis, you need to be aware that the rules on how bets are settled can vary significantly between bookmakers. 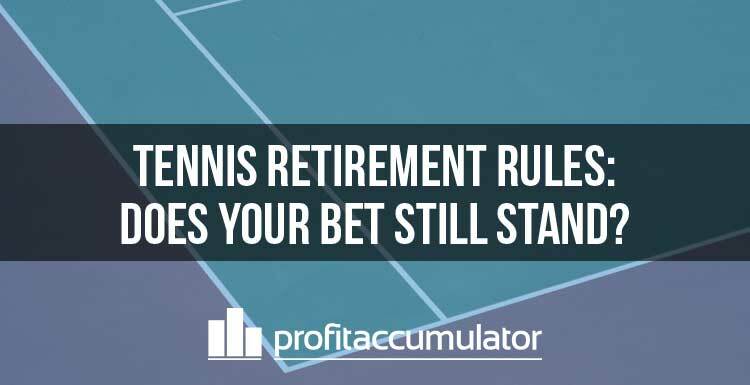 In particular, this applies to tennis retirement rules - ie what happens to your bet when a player retires or a match is abandoned? It's important to know because, if you bet with the wrong bookies, you could end up losing both of your bets - the back and the lay. Warning - These terms are correct at the time of posting this. If unsure of the rules, you should ALWAYS check them for yourself (use the links provided below). If you do find any changes, then please let us know via support. Generally, bookies can be put into three different groups with regards to tennis rules. Note that these rules only apply to betting on the winner of the match, and not necessarily to other markets. You can use the Profit Accumulator Dutching Calculator to dutch bets between bookies with matching rules. With this category, all bets are valid if at least one set is completed in the match. All of the exchanges fall into this category, so if you're backing a tennis bet with one of the bookies in this group, you can safely lay your bet on one of the exchanges. Skybet - See terms here - Rules allow Sky Bet back bets to be laid on the exchange as well as dutched with any other group. * Note on Paddy Power and Betfair Sportsbook - Although the rules match up with the exchanges, the disqualification rules don't. If your selection gets disqualified in the first set then your back bet would lose and your lay bet would be void. This is incredibly rare though (6 players have been disqualified since 1990) so although it isn't much of a risk, you should be aware. If you want to avoid this entirely then you can dutch your bets with Paddy Power or Betfair Sportsbook (the bookie you didn't place your initial bet with). Tennis rules type 2a - Bets are only valid if the full match is completed. In this category, bets are only valid if the full match is completed. If a player retires early, all bets are void. There are no exchanges in this category, so you should not lay bets off against bookies in this category. Instead, you would need to dutch your bets between bookies in this group. Be aware of 138bet and 188bet, who have different rules with regards to surface changes. Tennis rules type 2b - Bets are only valid if the full match is completed, however matches do not need to be complete if a player is disqualified. In this category, bets are only valid if the full match is completed. If a player retires early, all bets are void. There are no exchanges in this category, so you should not lay bets off against bookies in this category. Instead, you would need to dutch your bets between bookies in this group. The difference here is that if a player is disqualified, all bets will be settled on the player progressing to the next round/deemed the winner. Disqualification is incredibly rare (6 players have been disqualified since 1990). If you're prepared to take the small risk then you can dutch this group with group 2a. In the event of a disqualification you will have one losing bet and one void bet. 3 - Bets are valid as soon as the match starts and the player progressing to the next round will be deemed the winner. If the match fails to start, all bets will be void. There are no exchanges in this category, so you should not lay bets off against bookies in this category. Instead, you would need to dutch your bets between bookies in this group. These rules can change at any time so it is critical that you double check the rules yourself. We will not be responsible for any losses arising from out of date information in this post.